Many months ago, we booked a condo in Panama City Beach, Florida. (I should say, my mother-in-law booked the place. We consulted, but it was my in-laws’ dime.) This was well before the explosion of the Deepwater Horizon, long before oil started gushing out into the Gulf of Mexico. Needless to say of all the anguish caused by this disaster, my family vacation plans do not factor prominently. Yet still I worried about it. News reports indicated no oil there — until about a week before our trip. A piece of the Deepwater Horizon rig washed up on the beach there. And then came reports of tarballs. In the final days before our departure, I was reading up on public health advisories, effects of dispersant chemicals on toddlers, varying accounts of the situation on the ground (or in the water) in Panama City Beach, and all manner of online monitoring sites. It was maddeningly difficult, impossible really, to come to any kind of conclusion. I decided if we saw tarballs we would keep our daughter out of the Gulf waters. Dispersant is not so easily detected by the human eye, of course. Once we got there, we found the water crystal clear. I scouted for tarballs constantly but never saw one. In the end, it turns out I needn’t have worried so much. I think our girl spent no more than an hour in actual contact with the waters of the Gulf for a variety of reasons. On the morning of our first full day there, Xy took her down to the beach and was holding her when a wave knocked her down. That scared Persephone and she preferred the pool from that point forward. Later in the week the waves got increasingly rough as Hurricane Alex churned through the Gulf, and the water was closed for swimming anyway. We had a great time regardless. Here are some other random notes. It’s just over 300 miles from NOLA to PCB. This was our first long trip in the hybrid vehicle, and I was curious to see how it performed. It took less than a tank of gas to get there, and we got about 30 miles per gallon. We stayed at the Wyndham. I’m sure I’m not the first person to gaze skeptically upon all those highrise beachfront resorts, but you can’t beat a balcony looking over the ocean. Unfortunately we couldn’t get a two-bedroom accommodation so my in-laws were in a separate condo not far from ours, but it worked out all right. Internet connectivity was problematic and aggravating. I took a laptop from work, which I hooked up to Ethernet in our condo. I enjoyed unfettered net access for two days — and then it just stopped working for no apparent reason. The problem was not the Ethernet but the laptop I was using. A couple guys on the staff came out and tried to troubleshoot but ultimately we were unsuccessful. So I used the wifi network, in a common area not far from our condo, but that proved unreliable as well. The network had a tendency to disappear suddenly for no apparent reason, leaving me disconnected. Thus I was unable to participate in the “Contemplative Neuroscience” webinar which was my ostensible reason for bringing the laptop in the first place. I finished reading On Blue’s Waters and and started In Green’s Jungles . We missed the Hands Across the Sands event, alas. We could have walked there. My friend MAD, who used to live in PCB, recommended a number of local venues. We only went out to eat one night, and we tried a couple waterfront places he mentioned but the lines were way too long for us. We ended up at Scampy’s which proved to be quite delicious. There was no wait for dining on the patio, which I found incredible. Who wants to sit in a dark dining room on beautiful summer evening? Our friends DJ, Daisy and Lavender joined us for the last two nights. I didn’t think they were going to make it, but they got there just in time for the worst of the Alex weather. Then they stayed a couple nights after we left at a hotel. My mother-in-law Susie cooked all the major meals. Actually Xy did cook grits and grillades one night. I meant to prepare stuffed peppers but I forgot my recipe and Susie ended up doing that as well. I probably gained some weight on this vacation. Another contributing factor: We went through one bottle each of Averna, Bombay Sapphire, St. Germain, Hennessy and Limoncello, plus half a bottle of Amaretto and some wine and beer. Key cocktails: Vertigo, Extended Roman Holiday, Horse’s Neck, St. Germain & Soda, and the good old gin & tonic (with and without St. Germain). 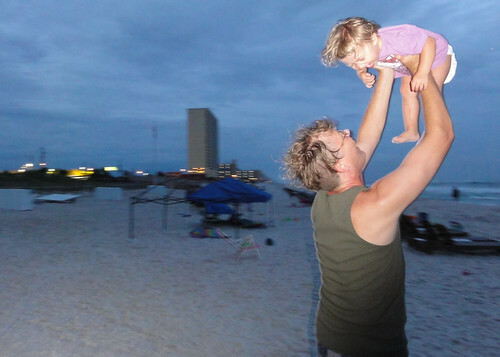 My favorite moment of the whole trip was when Persephone and I built a sand castle on the beach one evening. She was crushing towers as quickly as I could build them, until I managed to get a couple up in quick succession. Suddenly she got the idea — this could be a place where Cinderella might live. Soon she was helping me build the walls, and before you knew it we had a most, a tunnel, a bridge, and a domed ballroom. It didn’t look like much to be honest, but in our eyes it was a palace. Getting back to my original concern, I want to re-emphasize that I never saw a single tarball. There’s probably a good deal of variation up and down the beach, and who knows what tomorrow will bring. I also want to be clear that I think environmental issues are of primary importance to us all. I wouldn’t want to discount concerns about what’s happening in the Gulf right now. I believe it’s a crisis of epic proportions. Obviously we must be on guard against paranoia. When the water was closed to swimming and a plane came by dragging a banner that said “STAY OUT OF THE GULF” it was hard not to feel alarmed. My father-in-law spoke to another guest at the resort who was sure the closure was oil-related — yet I am certain it was because of the weather. Which is not to say that there was no oil. There’s a persistent trough of foam that develops between the first and second set of breaks. My mother-in-law said she thought it looked funny, sort of discolored, toward the later half of our stay, and she suspected it was because of oil. I was skeptical, but when Daisy arrived she said the same thing, and she’s a geologist after all. So who knows, maybe there was something to that. And as far as I know you can’t see dispersant, and no one is testing for it, and no one really knows how dangerous it might be to humans. But that Corexit stuff BP was using was banned in the UK. All of which gets back to my original point about the difficulty of getting truly reliable information about what’s going on out there. We can only make good decisions if we have good information, but there’s very few sources that I trust anymore. 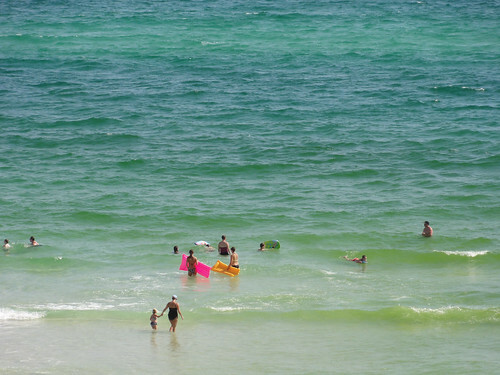 every time ive been to that part of the gulf of mexico i was amazed by the color of the water. glad yall got to see it sans tarballs.